'The Mighty Captain Marvel Vol. 2: Band of Sisters' is an overall uninspiring Danvers story – AiPT! 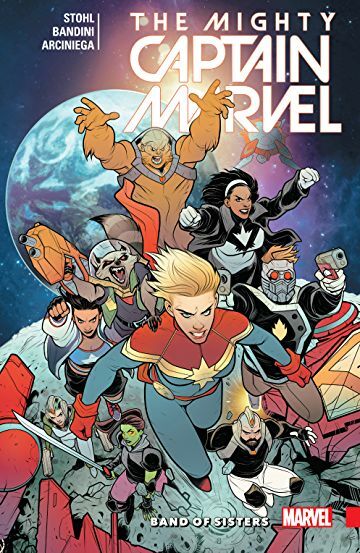 An endless horde of Citauri are bearing down on Earth and the only people standing in their way are Carol Danvers, her Alpha Flight squad, and the Guardians of the Galaxy. Stohl continues Danver’s story in The Mighty Captain Marvel: Band of Sisters. So is it good? Band of Sisters picks up right where volume one ends. Danvers has taken on three new Alpha Flight cadets, but their first experience while on the job is attempting to survive a Citauri onslaught. The majority of issues document this space fight and Captain Marvel’s attempts to keep her space station alive with an emphasis on these new cadets and their acclimation to the super heroics. The volume attempts to balance itself between a dramatic, high intensity action comic and a lighthearted funny comic. Unfortunately it’s not able to really define itself and my feelings are just as ambiguous. Something is slightly off throughout the comic, and it’s hard to put a finger on what exactly the disconnect is. Captain Marvel has so much potential as a character and I like how Stohl writes Danver’s character, but a large percentage of the trade is dedicated to her recruits which simply don’t draw the same appeal as Carol Danvers. The story takes place over the course of the longest, most drawn out space battle I’ve ever read and unfortunately it just comes off as uninspiring. The pacing and the panel reveals are intended to shock and awe, but don’t live up to the hype. It’s like expecting a fastball and getting a slow, disappointing change up. I did enjoy Michele Bandini’s art throughout the majority of the arc. It can be challenging trying to creative a diversity of panels when the entire arc takes place in the same general orbit of earth. The greatest panels are the ones where Bandini tries to do less than more and shows off some huge contrasts in scale and really pulls off some nice space scenes. The very last issue isn’t contained in the initial story arc and has art by Ro Stein and Ted Brandt which is much more cartoonish, but suits the more comical nature of the issue. Band of Sisters dedicates a little too much panel time to characters who aren’t Captain Marvel and the story suffers, but the main culprit is the abrupt pacing and transitions of the storyline. A story that's longer than necessary that focuses on characters who can't sustain reader interest.